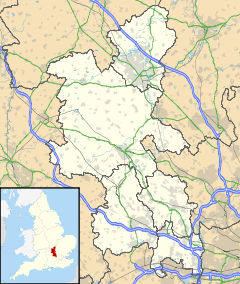 Farnham Common is a village in Buckinghamshire, England, 3 miles north of Slough and 3 miles south of Beaconsfield, on the A355 road. It adjoins the ancient woodland of Burnham Beeches, has an area of 2.5 miles and a population of around 6,000. It is in the civil parish of Farnham Royal. Farnham Royal was the main village with its church of St Mary's, shops, cottages and village pump situated in the centre junction of the cross roads. Farnham Common was known as 'Up End', being the common land of the parish where the livestock was grazed at certain times of the year. As this common area became more populated it became known as Farnham Common. Farnham Common is on the border of Burnham Beeches, the well known Beech forest owned by the City of London Corporation, having been given to the people of London as a place in the country for their recreation and pleasure. In the 1920s it was very common for coach loads of Londoners to come down for the day at weekends having tea at the tea rooms and enjoying the donkey rides. A few of the large old houses still remain such as Yew Place, Farnham Park (once called The Chase) and Caldicott. Yew Place was formerly known as The Rectory, part of which dates back to the time of King John. The original farmhouse was given to a coachman in the service of the Earl of Warwick. The Chase, now known as Farnham Park, was owned by Mr Carr Gomme, a very influential member of the community, being one of the main organisers of fund-raisers for the building of St John's Church. The house passed into the hands of Sir Gomer Berry, later Lord Kemsley, who had the organ dismantled from Farnham Park and gave it to St John's Church. Farnham Park is now the renowned Farnham Park Rehabilitation Centre presently owned by the East Berkshire Health Authority. Caldicott is a very imposing house situated on the edge of Burnham Beeches and was once owned by Mrs Harvey who gave money for the extension of Farnham Common Village Hall. Caldicott is now a Boys Preparatory School. A few names of note who have been associated with Farnham Common have been the artist Rex Whistler's mother, who lived in The Small House in Burnham Beeches; J. M. Barrie, the author of Peter Pan and Enid Blyton, the children's author. In Burnham Beeches there is a large beech tree under which Felix Mendelssohn used to sit and compose some of his works in 'peaceful splendour'. Joan Hammond, the opera singer, lived in the part of the village known as Egypt. The Moore family live in the village and hold the record of three generations of one family representing Great Britain in the Olympic Games, Major George Moore having competed in 1948, Lieut. Col. John Moore, his son, in 1956, 1960 and 1964 and Lieut. Mark Moore, his grandson, in 1984. Lieut. Col. John Moore received on O.B.E. for his services to skiing. Lois Allan invented Fuzzy Felt in her cottage in the village during World War II. More recently, Burnham Beeches has been used as a film set for some of the Harry Potter films,  including the Order of the Phoenix and the Deathly Hallows Part I.